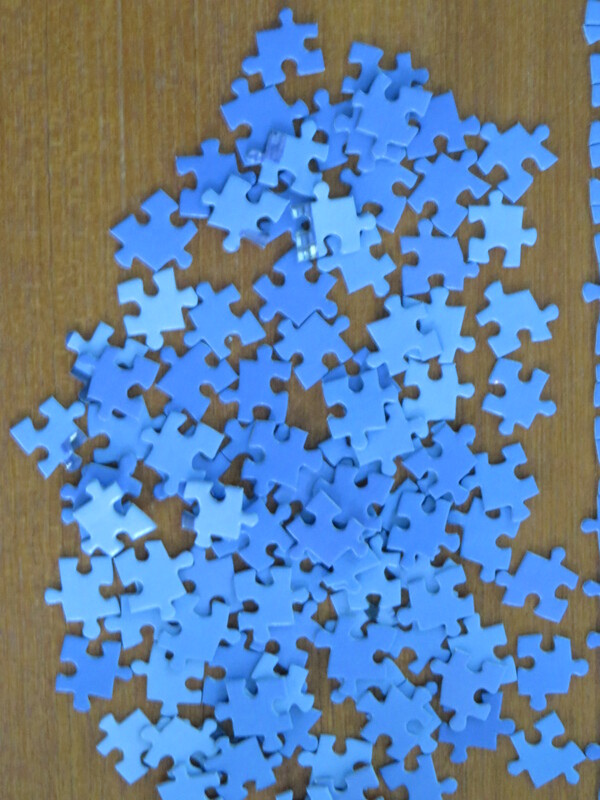 My visitor was surveying 1000 puzzle pieces, in only slightly varying shades of blue, spilled out on the dining room table–which is very rarely used for food. When heaven presents in sheets the solid hue? I still gravitate to peeks of blue: a heron clunkily lifting off from a river’s edge, my son’s azure eyes, a swatch of cobalt silk. But my thoughts remain so much more tangled up in those endless sheets of unreachable blue which, despite their vastness, seem so much more welcoming and hopeful than when they become shaded down by degrees to midnight. I feel less alone when blue occupies the horizon. I’m not sure I’ve ever felt as alone as I did at night, on an airplane hurtling so fast it seemed suspended in place, a dot in an infinite, barren black universe. When night falls, the sky seems both more and less than blue. With a dank, dark sky I can’t see my fellow creatures. Their calls and rustles turn foreboding, their locations less predictable. Snapped twigs begin to unnerve me only after nightfall. Not so in blue light. Monarchs dance, and stalwart fall flowers–even as their petals crisp and curl and begin to collapse–glow against it. Leaves and buds only alive by half beam in contrast. Even a raven’s caw seems less mournful against an unbroken cerulean sky. In her spare time, Stephanie works full-time, and then some, as an attorney. She has published articles and delivered talks in arcane fields like forensic evidentiary issues, jury instructions, and expert scientific witness preparation. She also is an adjunct professor at a law school on the banks of the Charles and loves that dirty water, as she will always think of Boston as her home. You are welcome to take a look at her Facebook author page, or follow @SMartinGlennon on Twitter. All content on this blog, unless otherwise attributed, is (c) 2012-2018 by Stephanie M. Glennon and should not be reproduced (in any form other than re-blogging in accordance with Wordpress protocol and the numerous other wee buttons at the bottom of each post) without the express permission of the domain holder. This entry was posted in Love and Loss and tagged "Fragmentary Blue", blue, color, midnight, Rambles in the Rainbow Garden: Part 4, Robert Frost. Bookmark the permalink. And who was the visitor who could quickly summon a blue burst verse of Robert Frost????? I think this is one of your best pieces. Enjoy very much of the reading, Stephanie! Beautifully done! Ah, blue happy skies. But the New Mexico night is salted with so much starlight that it loses all its foreboding…and replaces it with a humbling softness, a vast cosmos of comfort. The universe is far from barren! Follow Blog via Email; to see more photographs follow Schnitzelpond on Instagram.